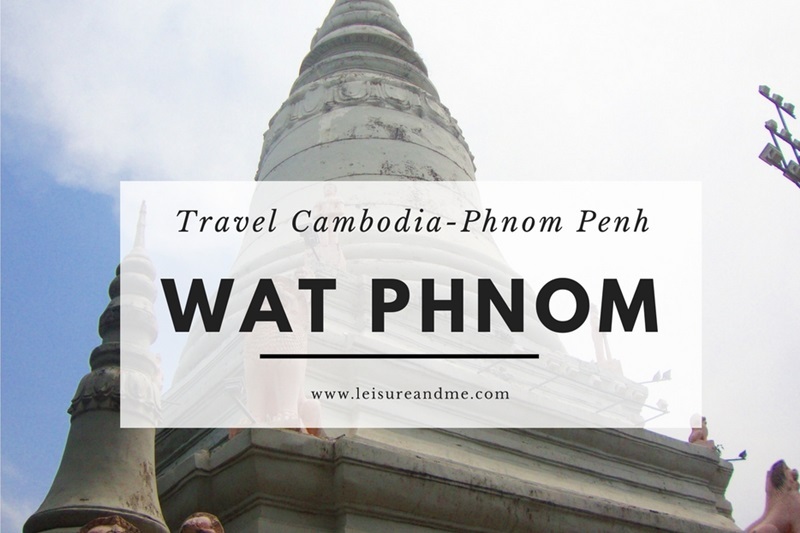 Wat Phnom is another must visit attraction in the busy city of Phnom Penh, which is the capital of Cambodia. On our 3rd day of Phnom Penh trip, we planned to visit this beautiful Buddhist temple right in the morning. We started our journey by hiring a tuk tuk and reached the Wat Phnom temple in around 15 minutes. Tuk tuk rides are exciting and we found it as a good way to tour around Phnom Penh city. Anyway, before writing about our experiences in this sacred temple of Phnom Penh, below is bit of the history as I found from Wikipedia. Nowadays Wat Phnom is a sacred temple for Buddhists and others who are in Cambodia for many offering and worshiping activities. 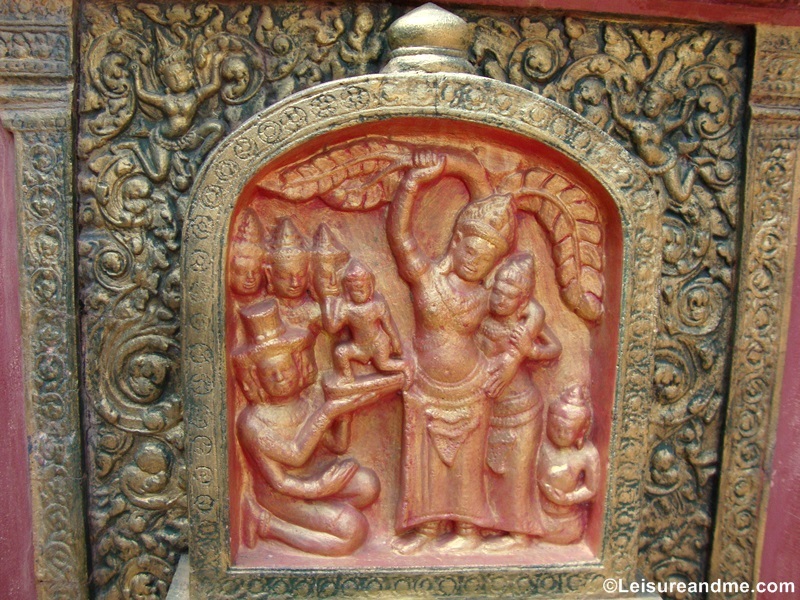 As per the legends, Lady Penh found a floating tree from the river which contained many Buddha statues. She built a shrine on a small hill which was manmade and kept these Buddha statues for worshipping. 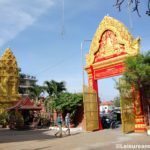 Lately this small shrine underwent different phases of construction and became one of the sacred places in Phnom Penh where people gather for celebrations and offerings. 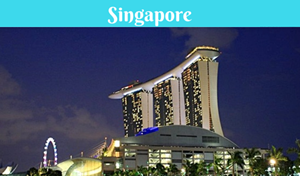 After our breakfast at Frangipani Royal Palace hotel, we started our day to visit around the city. 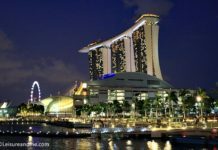 We hired a tuk tuk and we also had a plan to see the city during the tour. When we reached Wat Phnom, it was around 11 am. It was a sunny day. But, the grounds of Wat Phnom were shady with trees. 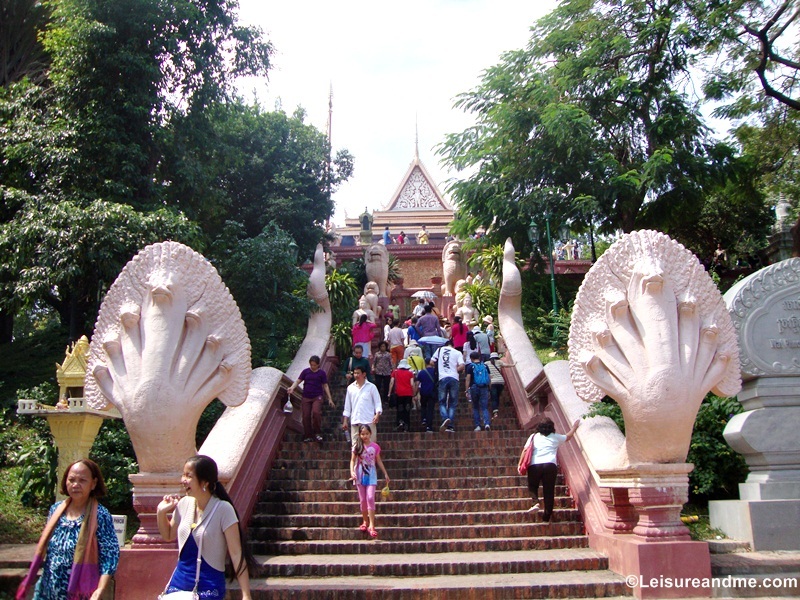 At the entrance, there is a stairway leading to the temple and pagoda. 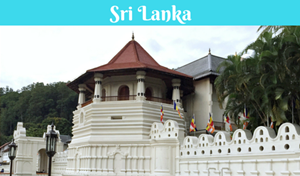 The entrance stairway is with huge statues which reminded me the guard stones of Sri Lankan Buddhist temples. I had the same feeling of entering into another Buddhist temple although this is a temple in Cambodia. We climbed the stairs. 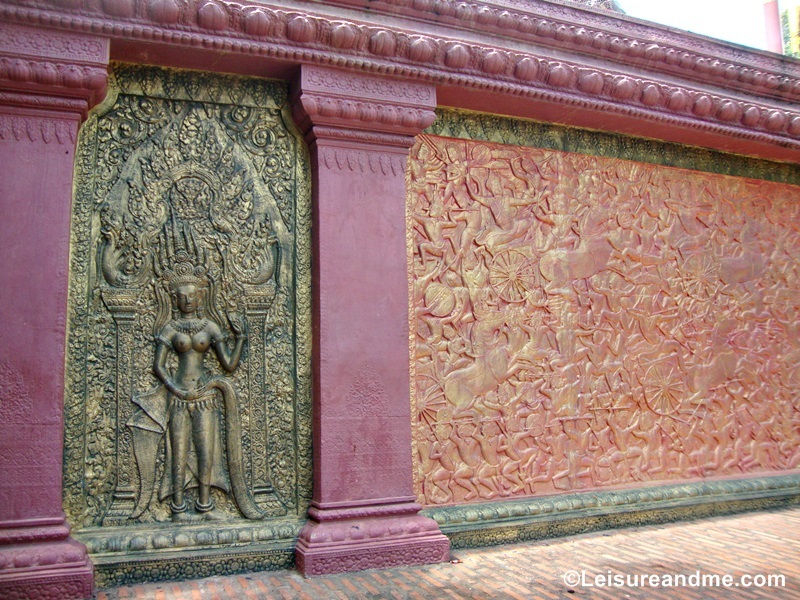 Before we reached the main pagoda, we passed a wall with beautiful murals. After passing the murals, then we entered in the main pagoda area. Most of devotees and tourists to this temple were walking here and there in the grounds of main pagoda. So, I also had a chance to look around the temple. After walking around, then we entered into the shrine room. It was a beautiful temple with lot of Buddha statues. 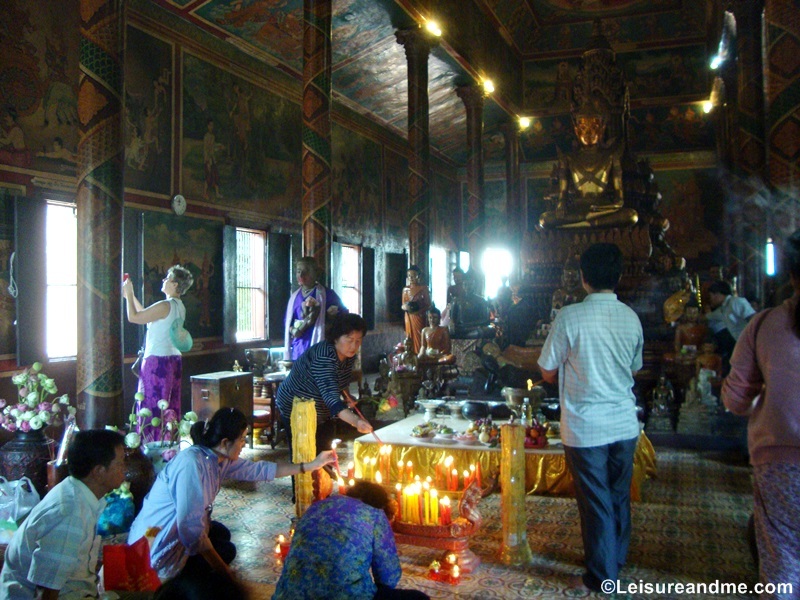 Although it is bit dark inside the temple, we could walk around viewing the paintings and Buddha statues. 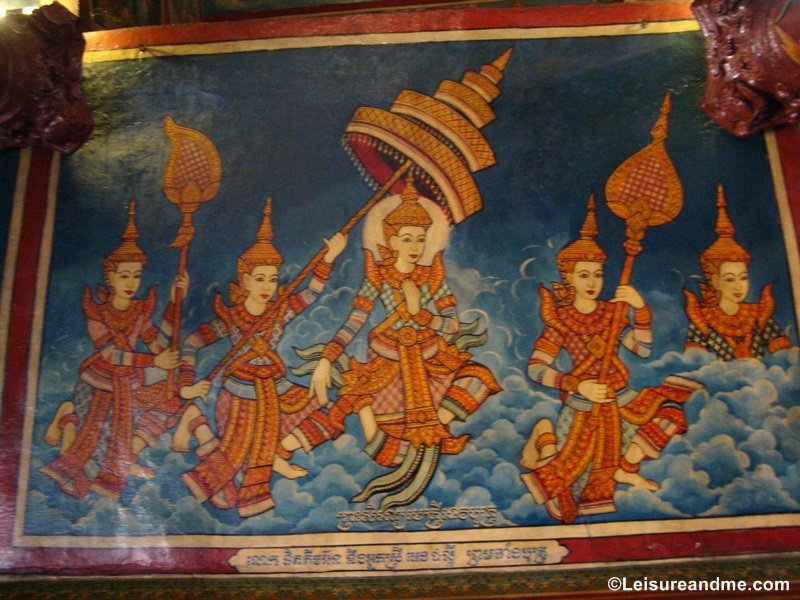 Walls and ceilings of the Wat Phnom temple were decorated with paintings. As a Buddhist I could understand some of the paintings and related stories from the Buddha life. 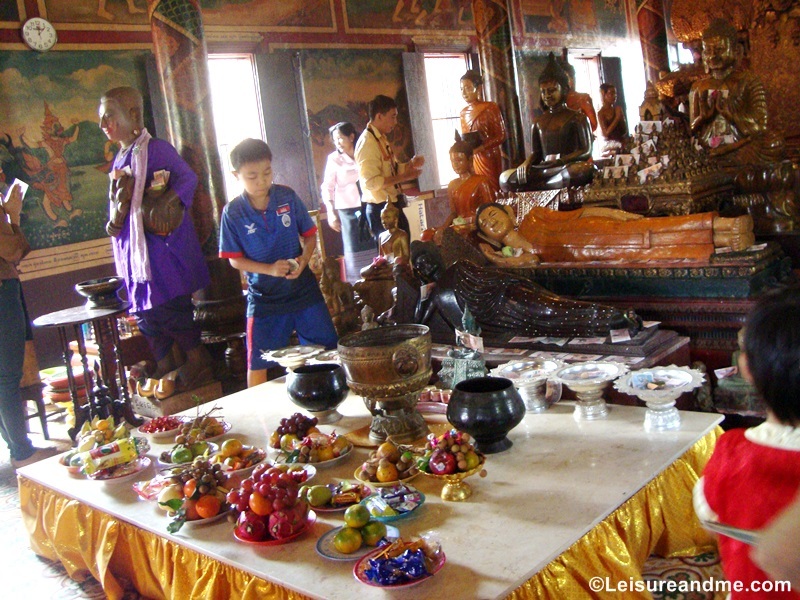 On the day we visited Wat Phnom, there were many other people who had visited this temple to worship Lord Buddha. As the main temple is bit small in space, it looked like bit crowded. But, that did not annoy or disturb us from visiting the temple. 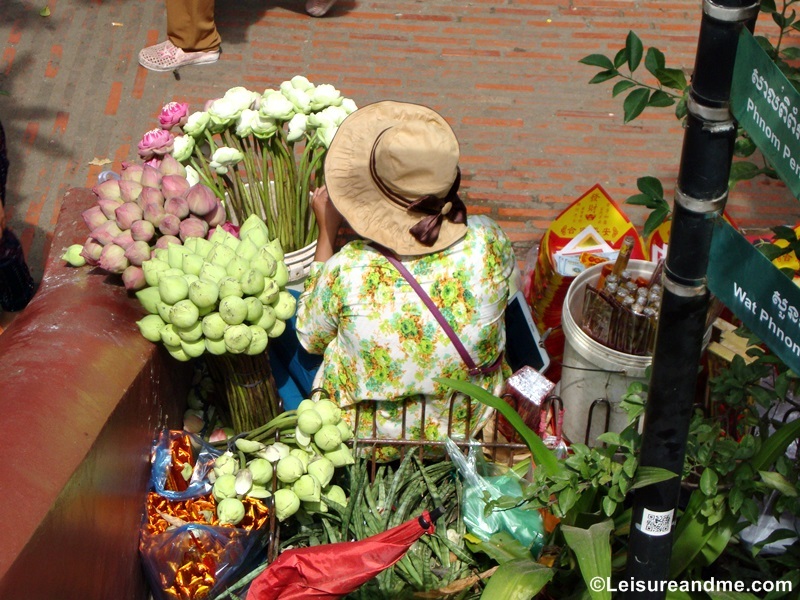 Outside the temple, there were people who sell incense sticks and flowers for those who visit Wat Phnom. 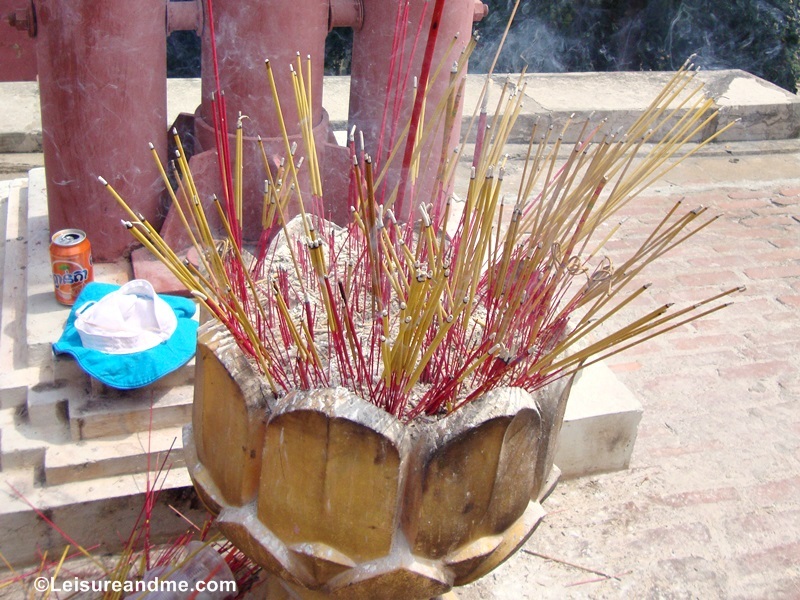 There is also a Chinese Shrine in one level of the hilly area. Other than that, we also found some souvenir shops in one side of the temple premises making it easy to buy some memorable things from Phnom Penh visit. 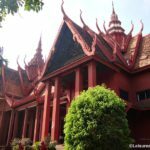 We did not spend much time in Wat Phnom as we had few other places to visit during the day.Sadly it was our last day in Phnom Penh. 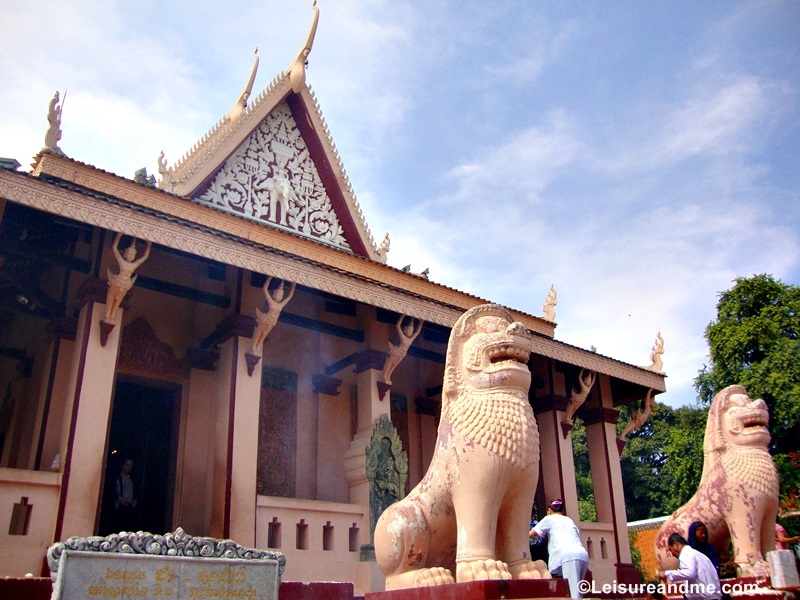 However, Wat Phnom is a really attractive temple in Phnom Penh which you must see if you visit Cambodia’s capital! How to reach Wat Phnom : You can reach Wat Phnom by hiring a Tuk Tuk. Usual Tuk Tuk rate to reach places around the city is around 3-4 USD. Central Market of Phnom Penh is very near to Wat Phnom. 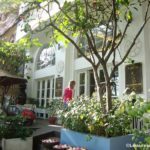 So, you can plan your itinerary with these attractions including a city tour around Phnom Penh. If you need a guide, most of the Tuk Tuk drivers work as guides too. Wat Phnom dress code: Dress properly as this is a Buddhist temple in Cambodia. 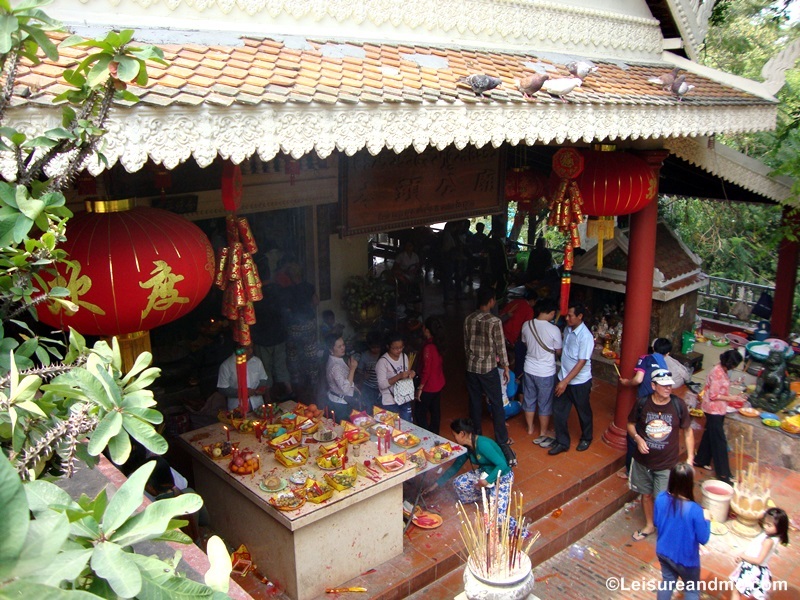 Check these tips about visiting a Buddhist temple. Morning is the best time to visit this temple to avoid the heat of the sun. 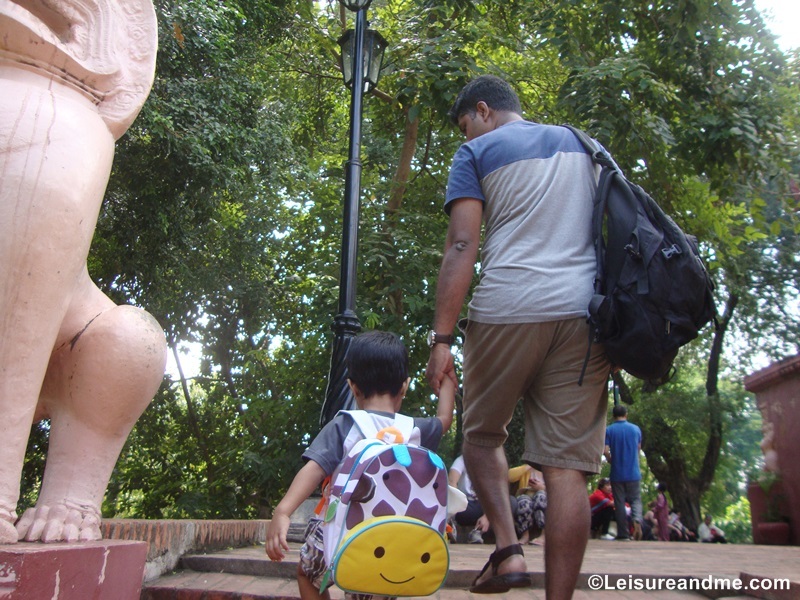 Safety : Phnom Penh is safe if you know these safety tips to visit Phnom Penh. 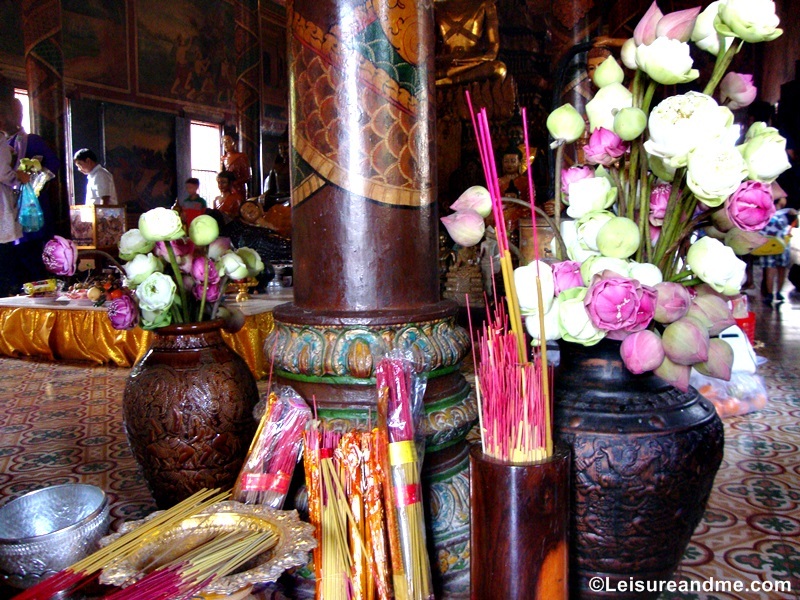 Have you been to Wat Phnom temple before? Or have you been to Cambodia? Please share your thoughts below. How pretty! I’ve never been to Cambodia before. I would love to see this temple one day. Love reading about history of places and this is a very nice read too. Your photos are beautiful, I’ve never been to Cambodia. I hope you will visit Cambodia one day,it is beautiful! When we travel, I always love to go some place with history, since we are history buffs. 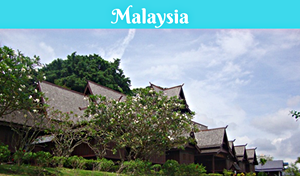 This place sounds and looks as if it’s loaded with rich culture and history! I have heard that Cambodia is so rich in culture! I would love to visit there one day! I haven’t been there yet. 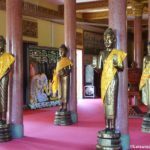 Wat Phnom sounds like a great place to visit. With so much culture and beautiful scenery. I have to admit I’ve not heard of Wat Phnom before, but what a beautiful looking place. I love hearing the lore of the area, thank you so much for sharing that. It is a beautiful temple in Phnom Penh,Cambodia.There are many other historical places such as Angkor Wat in Cambodia.So,these places may not popular same as other sites. thanks for all these great tips! You are super blessed to be able to travel with your family. I would do anything to have this opportunity! 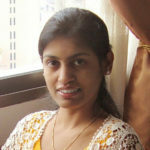 and your blog is even more amazing! I am so subscribing! cant wait to stay connected with you! This is why I want to see more of Asia. There’s so much to experience and discover. I think Cambodia is a beautiful place that’s worth visiting! Thanks for the history and all the fun facts as well. We have never been to Cambodia but it has been long on the list for the Angkor Wat temple. 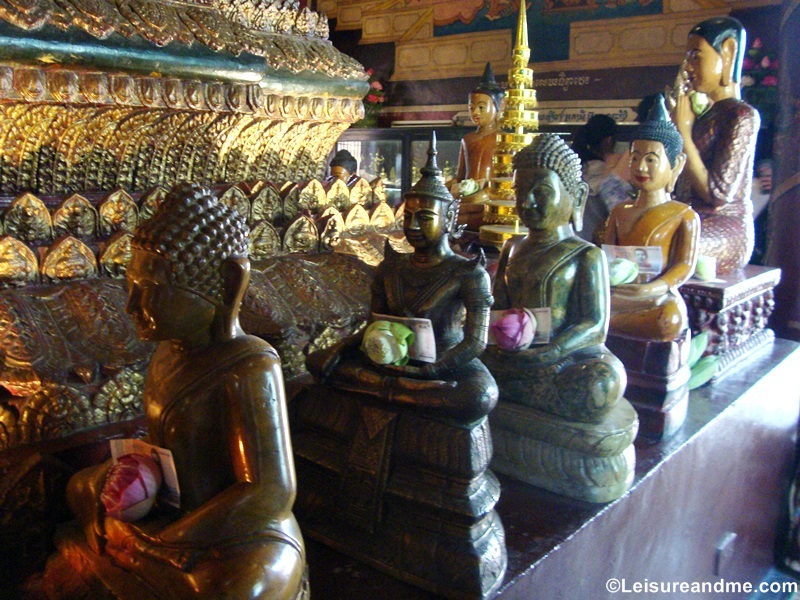 Wat Phnom looks equally stunning and magnificent with all those sculptures and architecture. Would love to visit sometime soon. 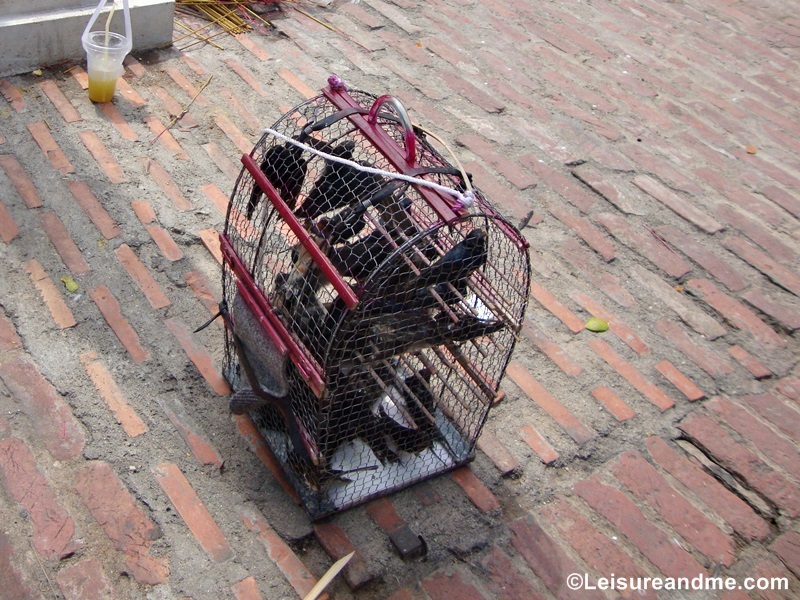 I’m the same as you, seeing these caged birds makes my heart ache and I would definitely pay to set them all free. 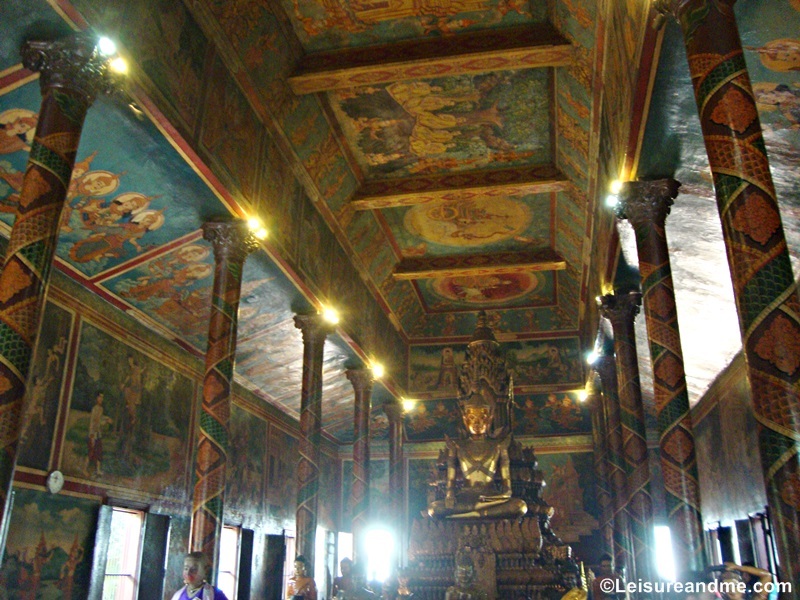 But on a lighter and positive note I love the look of the murals before the main pagoda. Beautiful. I think cambodia is rich in culture and vibrant. I love to visit their market! 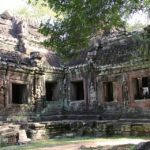 I’ve never been to Cambodia, but these are nice places of interest. There seem to be so many interesting places to visit there. I’ve never heard of this place. The architecture and decor here is amazing. I’d love to visit someday. Cambodia sounds like a very interesting and lovely place to visit. 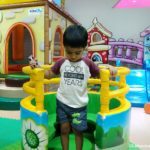 I love your awesome shots! What a neat place to visit! 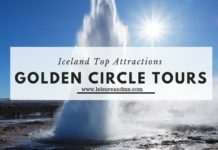 It looks like there is so much great history and architecture to see! I immediately felt sorry for those birds. That shouldn’t be allowed. As far as everything else, I love all of your photos. It makes me want to visit. yes,the caged birds are not a good things in a temple or in any place even it if for others to pay and free them.It is a beautiful temple. Wow, I definitely want to go to Cambodia now! Seems like a very interesting culture. Never been to Cambodia yet but I am still planning to see the Angkor Wat and now I guess I will include Phnom Penh and schedule a visit on this places.